Update: Following the release of hotfix 2.2.1.1 earlier today, all Season of the Drifter pinnacle weapons have been restored. Naturally, the infinite core exploit is no longer doable; it now costs cores to re-acquire pinnacle weapons. That's not the only fix in today's update, either. 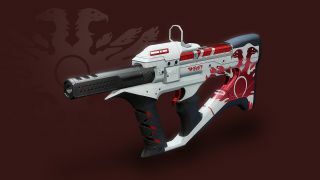 After all, Bungie disabled more than pinnacle weapons this week, and I'm not just talking about those leaked Wavesplitters. The perks on the Sentry Gambit Prime armor set were also disabled to combat a bug which let players deal 500% more damage to all Taken enemies, including the Primeval boss. Ironically, this bug was triggered by wearing and then removing the Sentry armor. As you can imagine, killing the boss five times faster than normal was a bit of a balance bugbear. Thankfully, that bug has been fixed as well and Sentries can return to guarding the bank. It took Destiny 2 players approximately 11 seconds to find an exploit for infinite enhancement cores in update 2.2.1, and Bungie have responded in kind. An emergency update released this afternoon disabled all Season of the Drifter pinnacle weapons to prevent further core dupes. You can still work toward earning these weapons, but you won't be able to purchase them from their respective vendors until further notice. In case you're wondering, the exploit worked exactly how you'd expect - and almost exactly like a previous core exploit which revolved around spamming Drifter's inventory. Simply put, players who'd already obtained a pinnacle weapon were able to claim it repeatedly at no cost. Pinnacle weapons come fully masterworked and yield seven enhancement cores when dismantled, so you can see how this would get out of hand quickly. As this GIF from Reddit user snarkfish demonstrates, it was entirely possible and incredibly easy to get hundreds of enhancement cores in minutes. As the latest Destiny 2 patch notes show, today's big update is filled with good changes, so it is a bummer to see a bug like this crop up. While you can still work toward this season's pinnacle weapons, you won't be able to claim them until this whole mess is resolved. I feel for the folks who were looking forward to tearing up Arc Week with a fresh Delirium 21% - and for the folks who only learned of this exploit after it was fixed. Funnily enough, this isn't the first looter shooter exploit to be hastily disabled this week: The Division 2 had a similar issue with projects.